We’d love your help. Let us know what’s wrong with this preview of You Only Live Once by Bridie Clark. You survived your freshman year at Kings Academy, the prestigious prep school in the New Hampshire hills, but hold the slow clap—turns out sophomore year’s the real grinder. You’ll have to deal with the stress of keeping up with the soul-crushing homework. Not to mention your glam classmates are throwing glitzy sweet sixteen parties this year and you’ll need a job if you w You survived your freshman year at Kings Academy, the prestigious prep school in the New Hampshire hills, but hold the slow clap—turns out sophomore year’s the real grinder. You’ll have to deal with the stress of keeping up with the soul-crushing homework. Not to mention your glam classmates are throwing glitzy sweet sixteen parties this year and you’ll need a job if you want to join. To ask other readers questions about You Only Live Once, please sign up. This book is SO boring. So boring. It lacks even the little bit of spark that infused its predecessor, Maybe Tonight?. And I can't get over how much and how casually all these 15-year-olds drink! Not even in secret, they get served alcohol in restaurants and bars and I'm like, "Hello? Carding? The law? Hello?" I mean, WTF. And it's so, so, so casual like the 15-year-old is saying, "I could use a glass of wine. Or even a whole bottle." And that's not even questioned or commented on. Actua This book is SO boring. So boring. It lacks even the little bit of spark that infused its predecessor, Maybe Tonight?. Actually, as I've said before, this book is EXACTLY like reading about 21/22-year-olds. Clark isn't making an attempt to even WRITE about high school students - she's simply writing characters in their early 20s and putting them in 14 and 15-year-old bodies. It's completely ridiculous. No one has any kind of normal or realistic teenage thoughts, reactions, or problems. It's about 22-year-olds, really. Not real impressed. So, my so-called "friends", who hated me at the end of Maybe Tonight? for turning them in are suddenly my "besties" again now?!? Yeah, riiiiiiight! 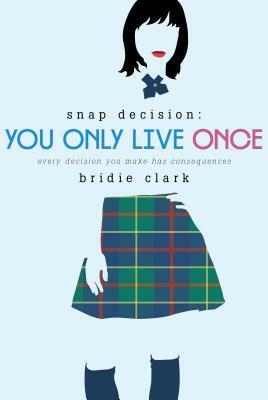 You Only Live Once by Brodie Clark portrays a story about a teenagers where you choose your story. At first she starts out in a school environment and you have to choose which people are her friends and where you want to go. Then you choose if you want it the job or not because it you have a lot with all your schoolwork and it would be a lot to take on. Your decisions make up how your story ends. If you choose to kiss the husband, you might end up losing your job. However, if you don't kiss him You Only Live Once by Brodie Clark portrays a story about a teenagers where you choose your story. At first she starts out in a school environment and you have to choose which people are her friends and where you want to go. Then you choose if you want it the job or not because it you have a lot with all your schoolwork and it would be a lot to take on. Your decisions make up how your story ends. If you choose to kiss the husband, you might end up losing your job. However, if you don't kiss him you still may end up losing your job. All the small decisions end up making something in the bigger picture. Like what not to do and why to make the correct decision. The character was you and you could either make the right decision or choose the fun way, it only affected you, your family, or your friends. You could go to that party in Texas or you could stay home and study. It's your life, your snap decisions. This book was amazing. What I liked about it was first of all, that you got to choose your story. I thought that was really interesting considering i've never read a book like that and I think it's the j my one. Also I liked that the main character was you but it was also planned to make decisions to change you. This author has amazing taste and knows how to get you to read her stuff. I liked wgeb ever she would make a sarcastic remark because I felt it made the story more interesting. Even though this book was amazing, there was a couple I thought he liked. First, I didn't like the character Rebecca. She and all her friends were stuck up and rude about the decision that you made to work. Also, they always talk about money which your character doesn't have. Other than that, this book was amazing. I always get a non-ending on my first read-through, and so does Brayden. It takes a few goes before you actually get a satisfying ending. Bridie’s debut Bridie Clark was born on October 7, 1977, and spent a happy childhood in West Hartford, CT. Her parents encouraged her early love of reading and writing.